In the year 1872 the potter Johann Kempf together with his wife Margarethe purchased house number 8 on Zechtalstrasse which in 1880 was equipped with a kiln; at the same time the couple purchased a strip of land, planning to expand. Their neighbors were the dealer and hobbyist porcelain decorator Klement Winter and his wife Julie, a local innkeeper. Both couples at first worked independently but soon Winter started to decorate items created by Kremer and the two decided to join forces. Premises however seemed a little too small and so Winter and his wife purchased surrounding plots of land in the years 1886 and 1887, at the same time founding the company of Winter & Co. together with Kempf and applying for a production concession which was granted late in 1887 and at first covered 'undecorated and decorated earthenware, unglazed and glazed'. That changed in 1888 later when the Winter family purchased Margarethe Kempf's half of the house number 8 on Zechtalstrasse as the kiln then became official company equipment and the production permit was changed to cover 'decorated earthenware, stoneware and porcelain'. All seemed to work out well but early in 1889 Klement and Julie Winter declared that they actually wanted to concentrate on porcelain production alone. Johann and Margarethe Kempf did not want to continue under such circumstances and after selling the remaining half of the house to the company they sold their company share to Andreas Maschauer and Hermann Lochschmidt, then relocating to house number 46 in the town of Horn, founding a new pottery in 1890 which evolved and eventually became the ⇒Porzellanfabrik Wehinger & Co..
Winter already knew the innkeeper Andreas Maschauer but from the two new partners it was the factory cashier Hermann Lochschmidt which actually had more money to invest and thus had more influence, resulting in the new company name of Winter, Lochschmidt & Co. after both officially joined the company on January 23rd 1890. The company on June 4th 1890 received the concession to build a larger porcelain factory on plot number 32 on Zechtalstrasse. The news spread quickly and on June 13th 1890 the porcelain decoration studio owner Friedrich Schmied from Schlaggenwald also joined the company, followed on October 27th 1890 by his wife Emilie - just in time to witness the first firings in the new factory. The now no longer required house number 8 on Zechtalstrasse was sold to the company of ⇒Kretschmann & Co. on March 15th 1891. Maschauer the whole time had kept in the background as he was merely interested in profit and could barely follow the discussions between Winter and Lochschmidt, many of which lead to disputes. Finally giving up, Herman Lochschmidt sold his part of the business to Ernst Renz in 1891. The situation calmed down a bit but two years later Maschauer retired after the decreasing number of orders and technical problems indicated that the best years of the business were over. Winter and Renz continued alone but problems increased and they soon were forced to sell the factory. The factory in 1895 was purchased by Karl Speck and patriotically named 'Austria', his plans and ideas for the factory however required more funds than he alone could provide. Eventually he met the businessman Benjamin F. Hunt jr. who was visiting the area on a business trip, searching for items suitable for sale via his store in Boston. ⇒Bejamin F. Hunt jr., owner of a Boston-based retail and import company, joined as partner and mainly funded operations, the factory being renamed accordingly. In 1899 the position of main decorator was taken over by Alois Klier from the town of Horn whose wife Louise had actually founded the ⇒Porzellan- und Tonwarenfabrik Klier for herself and her husband (see there). After a short period Hunt slowly decreased his financial support, not only because Speck was spending far too much money on ideas that did not turn out any profit. Hunt himself was planning to open an own factory and was already reallocating funds. He knew that a completely new factory would need financial reserves to bridge the gap until enough customer orders would have been placed, especially has Hunt wanted to start off with a few expensive specialists instead of relying on too many cheap but incapable regular workers. Without the full financial support of Hunt however, Speck quickly ran into financial trouble. Hunt quit company and eventually founded his own factory in the nearby town of Grünlas, the ⇒Egerländer Porzellanfabrik Elbogen. The factory was bought by the company of Speck's brother in-law Adolf Persch whose family already owned a factory in the small town of Hegewald. The next years were the first in factory history that passed without larger problems, business prospered because of the experience and contacts the Persch family provided. Running two factories however turned out to be fatal following the World Financial Crisis and even if the Porzellanfabrik Adolf Persch managed to survive at first, the factories in the end had to be put up for auction. The factory was leased to Julius Dietl who was also very experienced as he already owned a factory in Kaltenhof. Business was doing well at first, but during the first year of WWII orders started to decline and Dietl decided to sell his business. 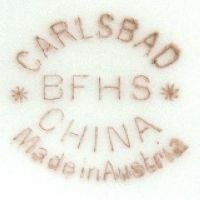 New proprietor was the porcelain manufacturer Rudolf Kämpf who had previously taken over the nearly completed factory of Benjamin F. Hunt jr. in Grünlas. Kämpf only required the factory in Elbogen as backup for a short period of time and then leased it to the PorAG Porzellan-Radiatoren G.m.b.H. in 1941. After minor modifications the factory started to produce porcelain radiators; in 1943 the PorAG Porzellan-Radiatoren G.m.b.H. decided to purchase the factory completely. Totally ignoring the fact that the market was changing and whole customer segments had already fallen away due to the war proved fatal: the company soon had difficulties acquiring sufficient supplies of raw materials and a short time later ran into financial problems which resulted in bankruptcy. The factory itself finally closed in 1945 and was later demolished. When looking at items with the 'BFHS' mark one should hold in mind that this mark was used only in Elbogen at the Karl Speck factory as well as during the period Hunt and his wife privately decorated items. Please hold in mind that the marks of the Adolf Persch company shown here are incomplete as they only include the marks used in Elbogen. The marks that company used in Hegewald, Mildeneichen and Raspenau will be included in the respective entries (when completed) and linked up with this page. 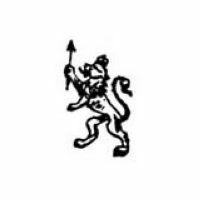 Used between 1887 and 1895, a rearing lion holding an arrow in its paws. Note that some sources say it was only used until 1891. Used between 1897 and 1901 on items made for Benjamin F. Hunt & Sons in Boston. 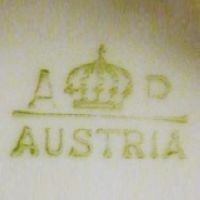 Used between 1902 and 1910, the initials 'A P' flanking a crown above 'AUSTRIA'. 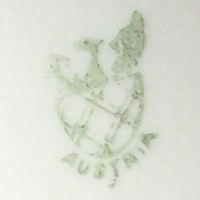 Used between 1902 and 1918, a Phoenix above a shield and 'AUSTRIA'. Used between 1902 and 1918. 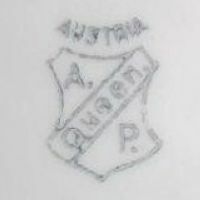 'AUSTRIA' above shield with initials 'A. P.', divided by a band stating the series name, 'QUEEN'. Used between 1902 and 1918. 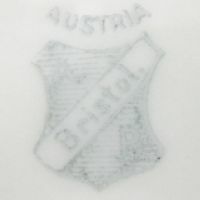 'AUSTRIA' above shield with the (barely visible) initials 'A. P.', divided by a band stating the series name, 'BRISTOL'. 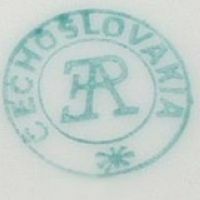 Used between 1918 and 1922 with 'ČECHOSLOVAKIA'. Initials 'EAP' used on items from Elbogen, items made in Hegewald state 'HAP'. 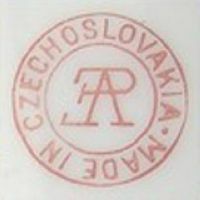 Used between 1922 and 1934 with 'MADE IN CZECHOSLOVAKIA'.